Rockstar's latest iteration on the popular Grand Theft Auto franchise is an all encompassing experience, allowing players to go on heists, race fancy cars, steal military fighter jets and play the in-game stock market. Of all those things, you might not have thought the stock market would be all that popular among players, but it is. Many have suggested that in-game currency can be hard to come by in the single player story mode, and with the exorbitant prices of some of the businesses, GTA's stock market is really the only way to get rich quick. 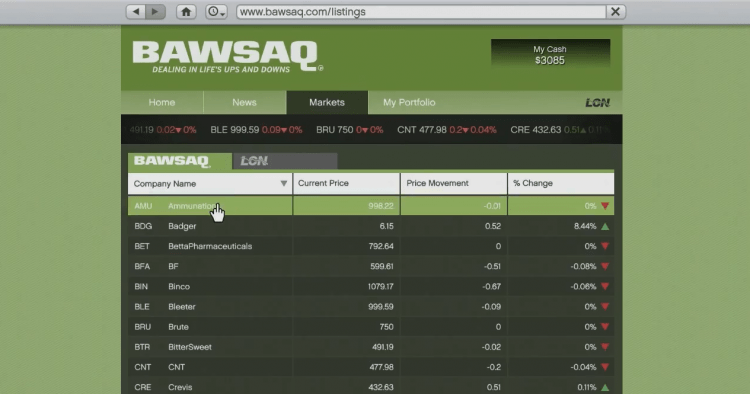 Players can buy and sell on two different markets, the BAWSAQ and the LCN, where prices can be influenced by in-game events. There are also dynamic events in the game that can influence the stock prices, and now players over at the GTA Market subreddit are testing out a theory based on working together to manipulate the BAWSAQ in their favor. The plan was to use a simple "pump and dump" scam, where players would band together to buy mass quantities of a certain stock all at the same time, and then immediately sell them to drastically drive the price down. The players would then re-purchase that same stock at the highly reduced rate, and then wait for the markets to level out for a hefty profit. To good to be true right? Right. Unfortunately it didn't really work according to plan, and now there's a bunch of Reddit users loading up a previous save file from before they lost their life's fortune in a stock market scam. The stock price was not effected by all the users' actions, the dynamic features that influence the market are most likely not driven by every GTA player in story mode the way they had intended, and thus the test was a failure. But what about GTA Online? That's next, the users will test their theories out in GTA's recently launched Online mode. The service has been plagued with expected server issues so far, but Rockstar has promised it is working on smoothing out the situation.